Y'all know that I love to match make! My favorite thing on my blog is the Singles Day that I host and I love LOVE LOVE that 13 couples have met and married through this special day! Marriage is a gift. It's amazing to have a partner to walk through life with and to share kids with and to love and cherish. But marriage can also be HARD! When you are in the trenches of little kids - it's hard to have energy to give to your partner at the end of the day. Or when you are in the middle of the taxi service known as parenting teens - it's more about matching schedules than meeting needs sometimes. I think every couple can benefit from marriage counseling. Whether you are walking through something difficult or just need someone to help you communicate better, marriage therapy is something every couple can benefit from. But it can be difficult to get to therapy sessions. They can be expensive. Or you may have a hard time finding time to make the appointments. If you work full time or if you are a SAHM with little babies - it can be tough. I'm partnering with an app that I think you will love! 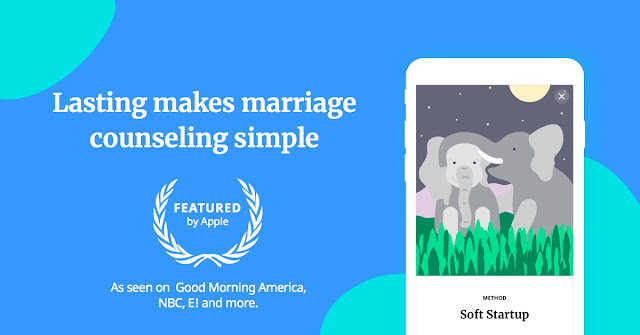 The app is created by the people behind The Knot and The Bump. They have a desire for marriages to LAST. After downloading the app - you take a quick assessment of your marriage. You can have your spouse also take the assessment and then it will give you sessions based on results to encourage you and help you through areas in your marriage that you can work on. There are hundreds of sessions that walk you through ways to strengthen your marriage. It pairs you with your spouse so you can both have the app and work through the same sessions. I was working on one and it asked me about how Scott had showed me love that day and I have to admit - as I started to type up the things he had done - I started smiling and it really helped me overlook when he didn't load the dishwasher. ha! It also offers you "moments". These are quick helpful tips you can read in about a minute to help you with issues that come up in your relationship. It will also send you reminders thoughout the day for things like "remind me to listen to my partner vent without trying to fix things at" or "remind me to ask my partner how I can help them". Sounds simple but these reminders can turn into healthy habits. I'm a big fan of this app. It's $12 a month. That's a TINY fraction of the cost of marriage therapy and worth every penny when it means your marriage will get stronger! Our kids will all leave the house one day (or maybe they already have) and we want to love being left with our spouse! Lasting gets to know your relationship and creates a program to help you build and maintain the health of your marriage. Whether you want to deepen your connection in new ways, repair a broken part of your marriage, or learn specific skills, like communication and conflict, Lasting will walk with you every step of the way with counsel based on decades of research. "Lasting is like a gym membership for your marriage." And a strong marriage is one of the best gives we can give our kids. So a few minutes on an app every day can really make a difference - isn't it worth a try? Version 2.0 JUST released for a new and better version! Try it out today! Click HERE!